Amjad Qourshah, an Islamic studies professor at the University of Amman in Jordan with ties to the Muslim American Society (MAS) and the Islamic Circle of North America (ICNA), has unleashed a tirade of anti-Christian venom against Egypt's Copts, accusing them of burning their own churches. His Facebook tirade, translated here by the Investigative Project on Terrorism, also included an image of Jesus that is reminiscent of the 2006 Danish cartoon depicting the Muslim prophet Muhammad with a bomb in his turban. 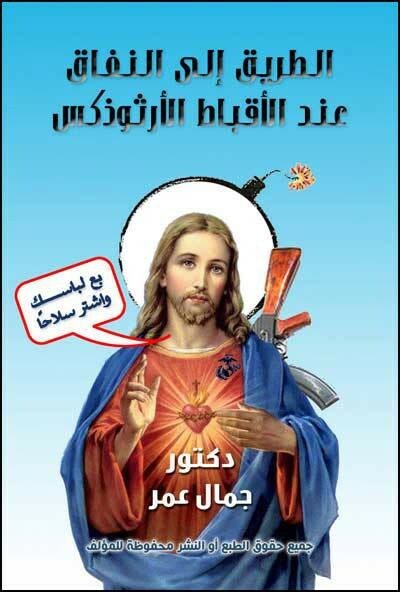 In this case, the Sacred Heart image depicts Jesus with an AK-47 over his shoulder with a bomb halo surrounding his head, saying "Jesus says: 'Sell your clothes and buy arms." The caption above the image says: "The way to hypocrisy For the Orthodox Copts." Qourshah has spoken to MAS audiences twice this year – appearing at events in Chicago in May and in Dallas earlier this month. He also spoke at the MAS-ICNA convention last December. The publication of the Muhammad cartoon led to widespread rioting and was condemned by MAS and by other Muslim groups around the world. "This has nothing to do with free speech," Mahdi Bray, then-head of MAS's political arm, said after the Philadelphia Inquirer republished the Muhammad cartoon in February 2006. "It's pure sensationalism that reeks of religious disrespect." MAS and fellow Islamist groups, the Council on American Islamic Relations (CAIR) and the Islamic Circle of North America (ICNA), have been silent about the violence against Egypt's Christians by the Muslim Brotherhood. Those groups either have roots in the Muslim Brotherhood or have worked with it. The Muslim Public Affairs Council (MPAC) has similarly been silent. "It is entirely predictable that such a person would be invited to speak for the Muslim American Society (MAS), which has been referred to as part of the 'nucleus' of the Muslim Brotherhood here in the United States," said Zuhdi Jasser, president of the American Islamic Forum for Democracy. "Only a brief perusal of the responses to the current situation in Egypt from Muslim Brotherhood legacy groups in the United States reveals a deep and abiding loyalty to the Muslim Brotherhood, a disdain for pro-liberty Muslims and dissidents, and ambivalence at very best when it comes to the plight of Christians and other minorities in the Middle East. "Lines are being drawn in the sand, and as more of this rhetoric reveals itself, Americans and others will see the true nature of groups like MAS and others," Jasser continued. "As we are alarmed, may we be also inspired to act – empowering Muslims and our allies who seek reform of our community and the protection of liberty." Qourshah is not an exception when it comes to radical speakers at MAS-ICNA conferences. Saudi Sheikh Ayed Al-Qarni was considered too radical to be admitted to the United States for last year's national convention. And MAS violated a promise to no longer invite Egyptian Islamist Ragheb Elsergany to its events after he launched into an extreme anti-Israel diatribe at the December 2009 MAS-ICNA convention. At least 58 churches, Christian schools and monasteries have been torched by Muslim Brotherhood supporters in the past week in the worst anti-Christian violence in Egypt in 700 years. Egypt's Youm7 reports that more than 200 homes and businesses owned by Copts and other Christian groups also have been torched since Egyptian security forces stormed the Muslim Brotherhood's encampments in Cairo last Wednesday. At least nine Christians have been killed around Egypt in the past week. Qourshah alleged it is all a conspiracy. "The Christians are burning their churches on the instructions of State Security to win the sympathy of the West so that it continues to support the coup," he wrote Aug. 14 on his Facebook page. The absurdity of Qourshah's rhetoric is underscored by the fact rioters who torched St. George Cathedral in Sohag were heard screaming "Allahu Akbar!" as they burned the church to the ground. A memo published last week purportedly from the Muslim Brotherhood's political wing, the Freedom and Justice Party, similarly attacked the Copts and appears to endorse the church burnings. Anti-Christian graffiti with slogans such as "Mohamed is the prophet of Allah" and "Islam is the solution" have been commonplace. The Coptic Catholic bishop of Luxor reported that Islamists tried breaking into his house to torch it. In at least one instance, a banner resembling al-Qaida's black flag was hoisted over a gate where the cross had been. Additionally, Muslim Brotherhood gangs marked Christian homes and businesses with check marks before they were torched. In the town of Minya black "X"s were scrawled on Christian-owned stores while red "X"s were painted on Muslim-owned stores. Moderate Muslims who have no connections with the Brotherhood have helped their Christian neighbors fight the fires. Qourshah repeats many of the same canards found in the alleged Freedom and Justice Party memo, libeling them as responsible for the violence in Egypt. In fact, the Coptic Church has urged its followers to refrain from violence even when they are attacked. "The Pope of the Copts in Egypt encourages and supports the killing of innocent people at the peaceful sit-in and encourages burning of blameless women in their tents ... He calls on the Egyptian army to annihilate the peaceful protesters!!!!!" Qourshah wrote in his Facebook post. "Where are you, oh hypocrites who claim to love freedom and peace, when you are at the head of sedition. Your channels were the first to call for war, strife and lies. Your chiefs were the first to ignite sectarian strife set fire." The truth is that many of the protesters were neither peaceful nor blameless. Reports that Brotherhood opponents were being tortured or killed were conveyed by Amnesty International, an organization that can hardly be labeled right-wing or sympathetic to autocratic governments. Some Muslim Brotherhood members stockpiled weapons and armed themselves with AK-47s and other automatic weapons. Such weapons caches were found in the Al-Adawiya mosque adjacent to the Rebaa al-Adawiya Square where one of the encampments was located. As soon as the military dispersed the encampments, Islamists sought to exact their revenge on Egypt's Christian minority, who comprise about 10 percent of Egypt's 85 million people. In his rant, Qourshah also forgets that the army sided with millions of Egyptians, Muslims and Christians alike, who took to the streets demanding an end to the Muslim Brotherhood's extremist rule. "The Egyptian army on July 3rd, 2013 simply sided with the twenty-five million Egyptians who took to the streets to say 'no' to the radicalization of Egypt by the Muslim Brotherhood. Morsi was doing his utmost to turn Egypt into a replica of what Afghanistan was before 2001," Tarek Heggy, a member of Egypt's liberal intelligentsia told Catholic World Report. "The Muslim Brothers' 369 days in power in Egypt are there to show that a theocratic organization cannot govern democratically. Let's just think a moment about what Hamas is doing in Gaza. Theocracy is the exact opposite of democracy. The West must remind itself that there is no difference between Al Qaeda and political Islam." The Coptic Church has consistently called on Egyptians to avoid violence since Morsi fell. "I ask all Egyptians to use their heads wisely, practice self-restraint and avoid any violence, attacks or recklessness against humanity or property," Pope Tawadros II wrote on his Twitter feed Aug. 13, the day before the Egyptian security forces ousted the Muslim Brotherhood from their encampments. Despite this plea, and despite lacking anything close to evidence to support his claims, Qourshah insists it is the Copts instigating violence. "You burn our chiefs and you talk about the inadmissibility of the interference of clerics in politics, and you attack Islamists on that basis," he wrote. "Did any of you dare to utter a letter of the Pope of the Copts and the heads of the Coptic Church forbidding plunging into politics 24 hours on the satellite channels and their incitement to murder and encouraging poor ignorant uncultured Copts to descend to the streets for use the, as fuel for violence!!!" The Copts have remained unarmed despite brutal Islamist attacks. Jordan's Saraya News blasted Qourshah's depiction of Jesus and his comments about the violence against Christians in Egypt: "We say to Dr. Amjad Qourshah – like it or not –you are a public figure, and calculated against you is every letter you speak or write, therefore fear God for yourself and for Islam and Muslims, and keep what you publish from what is not worthy of you as an Islamic thinker and preacher of the religion of God as you think yourself. "We consider you far from the true preacher committed to the fundamentals of Da'wa. O God, how we follow you and love you, oh God, how we wish you were silent ... Speak well or or shut up ... Shut up Qourshah, you destroy and do not fix things ... Shut up!" The Muslim American Society and Islamic Circle of North America should consider this rebuke when drawing up its next list of conference speakers. Note: IPT will moderate reader comments. We reserve the right to edit or remove any comment we determine to be inappropriate. This includes, but is not limited to, comments that include swearing, name calling, or offensive language involving race, religion or ethnicity. All comments must include an email address for verification. Click here to see the top 25 recent comments.